4 Bedroom rental villa with a superb ocean view! Lomchoy is a one of residence in Samsara Estate located in Kamala area. 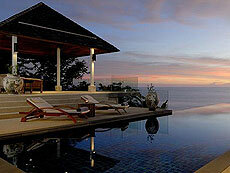 Spacious and elegantly decorated in the villa combine subtle Asian and Modern furnishings with throughly convenience. A large outdoor deck with dining area, traditional Thai sala and 14 meter infinity-edge pool with ocean view take full advantage of the relaxation. Inside the villa have a large living room where bright sunlight comes in, Home theater, Home office etc, that makes your rental villa stay full of satisfaction.